At the weekly sung Mass here at Maiden Lane, we have an obvious reason for which to thank God for raising up Pope Benedict to care for us as Supreme Pontiff. The Mass which began as part of an indult, tolerated thanks to the work of the Latin Mass Society, is now, thanks to Pope Benedict, no longer considered to be abolished, abrogated or generally forbidden, but to have been in principle always permitted, never abrogated, and to have rightful "citizenship" within the Church. Those who think of such a concern as the province of a few enthusiasts fail to understand the Holy Father’s intention expressed in Summorum Pontificum, that the celebration of the classical form of the Roman Rite should enrich the life of the Church, help to establish a greater sense of the sacred in every celebration of the Sacred Liturgy, and foster unity within the Church. Most of you will remember that afternoon, on 19 April 2005, watching on the television screen or hearing from friends, the news that Cardinal Ratzinger had been elected Pope and the great joy that this had happened. The exuberant faces of young seminarians and women religious remain a happy memory of that great day. His pontificate, if you accept the propaganda of the mainstream media, or the liberal Catholic press, has been “dogged by controversy.” We could put it another way – his work for the Lord has been subject to furious opposition from the world because he stands for Christ and is unafraid to say what needs to be said. We may recall his intellectual challenge to the Muslims in his address at Regensburg, his real steps towards the reconciliation of the SSPX, his trumping of every ecumenical initiative by actually providing a mechanism for Church unity in Anglicanorum Coetibus: on these occasions, he has stepped out onto the lake like St Peter. Has he faltered? Has he been assailed by doubts and fears? That is between him and God – what we do know is that Christ has constantly sustained him. 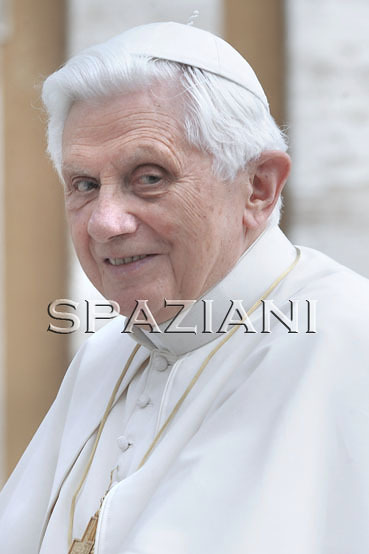 The hallmark of the papacy of Pope Benedict has been his idea of the “hermeneutic of continuity”, an idea which is, as you know, close to my own heart. Joseph Ratzinger is a great theologian in his own right. My own theory is that Pope John Paul II appointed him as prefect of the Congregation for the Doctrine of the Faith precisely because he could meet the likes of Hans Kung, Karl Rahner, and Edward Schillebeeckx on equal terms. The affirmation that Vatican II should be understood in continuity with the tradition of the Church goes clean contrary to most of the theological prejudice which was current during my own days as a student. The usual theme was that in the old days we used to thing one thing but now we think differently. Before the Council, we used to pray in one way but now we pray differently. Most important of all, it was asserted that our manner of worshipping God in the Sacred Liturgy was radically changed by a complete break with the past. Pope Benedict’s idea of the hermeneutic of reform and continuity within the one subject Church allows us once again to take up without scruple the whole of the tradition of the Church in all of these areas. This seminal idea also offers a real possibility for union with the SSPX. If we can read the second Vatican Council as not contradicting the previous papal encyclicals, if we can say that the tradition of the Church is maintained, then there is a new hope that a million souls and their pastors may be part of a united effort to evangelise the world and to resist the onslaught of secularism. St Vincent Ferrer said that when we pray for the Pope, it is not the same as praying for anyone else. If a priest does wrong, we may appeal to his bishop. If the bishop does wrong, we may appeal to the Pope. If the Pope does wrong, he has no superior on earth but is subject immediately to God since he is the Vicar of Christ. Thanks be to God we have a great and good Pope. When we pray for him, we are praying to his immediate superior to support and encourage him in his ministry. Let us pray to God for him now asking for many years and for strength and determination to do what is necessary for the reform of the Church.